Oh my! They both look absolutely gorgeous. Gorgeous outfits ! Those jewels, especially the bangles are drool worthy. I just love how deeply traditional the ceremonies were. Most importantly the laughter and love oozing from their face is heartwarming. In the first pic, there is electric current between them. Gorgeous. Loving the vibe of the South Indian wedding! Wish they’d release full length pics of all three looks though! love love love everything! perfection! Wowwwwwedddddd ! Seriously. Air of love.. I love the Konkani bride look just Coz you can see more of her! She’s just so beautiful! Such happy faces. What is there not to like (or even Love)? Amazing energy in these images! There is nothing that i do not love here! Absolute perfection.. but most of all I love their smiles, it lights up the pics! Wow! Agree. Inspite of all that jewellery and rich clothes, all I can see is the beautiful smile on Deepika’s face, her beautiful eyes, the glow on her face and love and chemistry between them. Nature made, not bollywood or designer made. These look like stills from a movie or a ad…just gorgeous! They look so happy and that’s what makes this so beautiful. Yeah it’s actually like a movie or ad content.. positively. Very picturesque, lively. Okay.. is this a wedding that never ends? What’s with this daily dose of a picture a day? Also, how are they wearing so many sets of clothes for one wedding? All of this looks more like a Sabya catalog photo shoot than a wedding – like one that’s made for mags. Is this wedding just another promotional event? Their PR needs to clam down. Wow…welcome to Desi weddings my dear! Mine was in no way close to Ranveer and Deepika’s wedding but it lasted a few days. I can only imagine how difficult it is to plan something so elaborate with such success. Just a reminder that both have grown up in different hindu cultures and to solemnize something so special with the two ceremonies is a beautiful thing, hence, several/different traditional attires. And, of course you’re going to see Sabyasachi vibes pasted everywhere, he bloody helped planned their wedding trousseau! 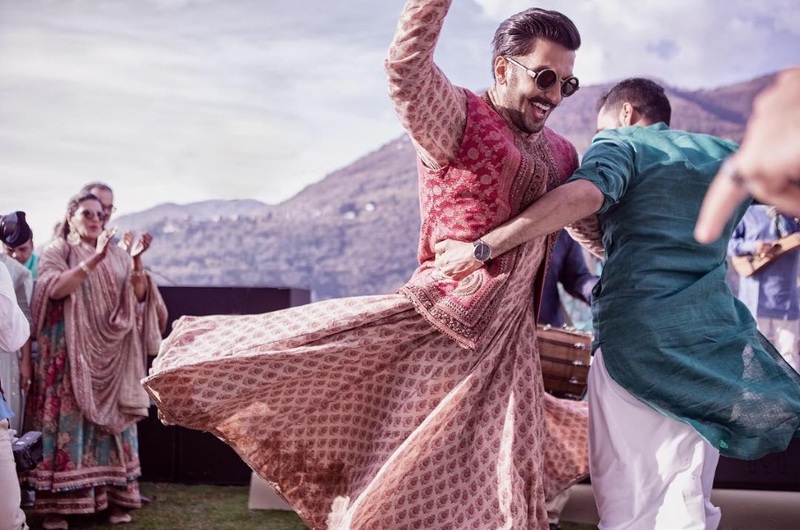 How many desi weddings have you seen where block print outfits are worn, that too, by the groom! Enjoy the old world charm/craftsmanship that Sabyasachi holds dear to his heart, and celebs wearing his creations; they are all keeping our traditions intact in this changing world. Wow so much bitterness. For many cultures, multiple ceremonies are held during a wedding (esp. south Indian, speaking from experience) which calls for many outfit changes. I see 2 dresses for Konkani ( which is lesser than a typical south Indian wedding), 1 for mehendi and 1 for her Sindhi ceremony. And good photography makes everyone’s weddings look like this! It is the regal outfits and absolutely splendid jewellery that make it shine. Also, the pics come out a few days after the wedding and it is natural to delay it. I wonder why so much negativity. The pics are fantastic. Major goals! It’s an Indian wedding. What did you expect? Also, they had literally released just two pictures from their wedding. These were released all at once a week after the wedding. Tujko mirchi lagi toh main Kya karoon! Lol! One picture a week, seriously. 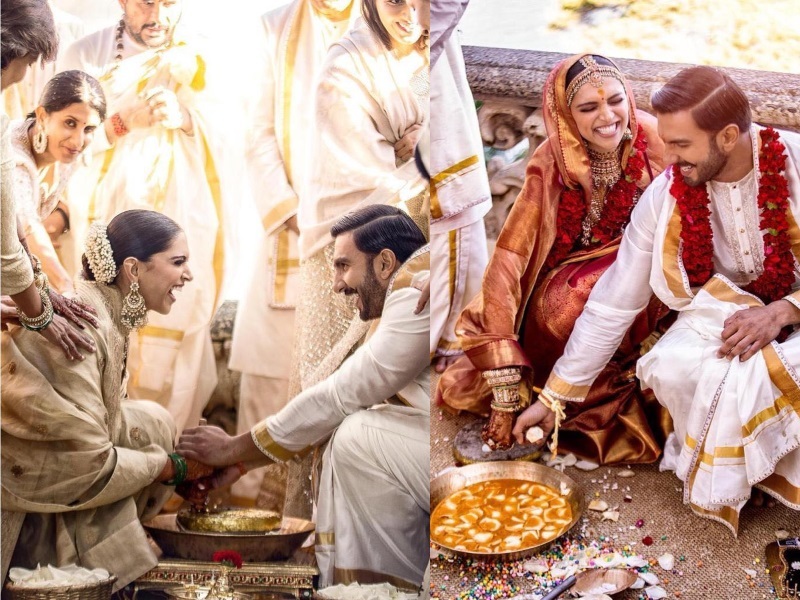 They released two picture after both the Konkani and Anand Karaj wedding ceremonies were finished. Released the other pics one week after the marriage. Where is the milking? I had 6 outfit change during my weeding that went for about a week. I remember posting candid photos of all the ceremony for about three weeks that followed(Little childish I know :D ). Its very common to have multiple events in most hindu weddings. Wait for it – there are 2 receptions coming up too. Each look of them is striking. Love how dapper Ranveer looks in these outfits and Deepika, oh my God, such a beautiful woman. Gorgeousness in each picture. The backdrop of Lake Como adds to the beauty. Whats not to love! I knew to expect that when you take two gorgeous people with access to the best , the result would be beautiful. But these pictures still took my breath away. They both look absolutely fantastic and I love the genuine happiness and just good old fun these photos radiate. It’s cliche but these two are #couplegoals. Both of them look really gorgeous and happy. 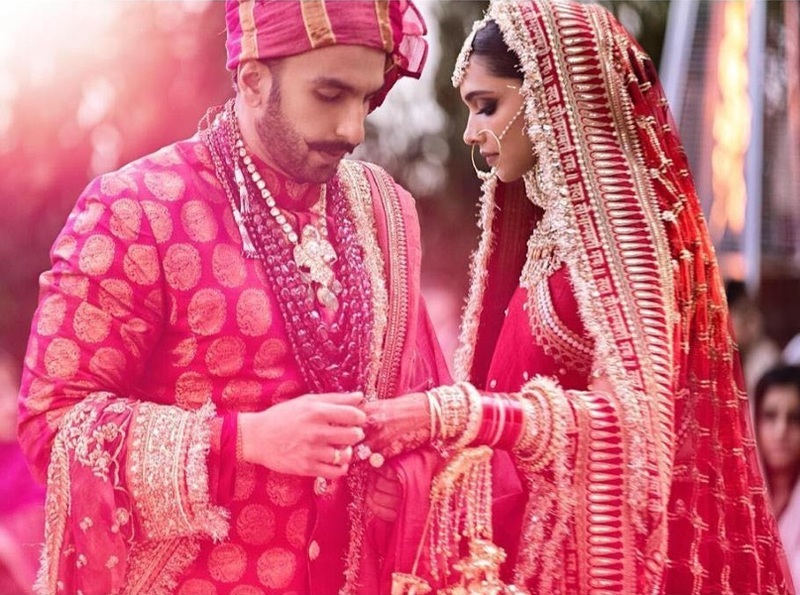 She looks resplendent as the Konkani bride, Ranveer looks amazing too. They look so gorgeous and so happy. Loved seeing the pics … they look like they are from a shoot. The wedding looks like it was a lot of fun! Congratulations again to the happy couple. They look beautiful! Not saying it is but it looks a bit staged! Just because all the pictures released are professionally taken! And, for that all the weddings look the same when we look at the images taken by photographer. I think, it’s a trend these days to just nitpick celebrity weddings! True. These pictures look like stills from an ad/movie shoot. Obviously if its so staged it will look good, not to mention this is in some sense an extension of their tried and tested wardrobe from their past three movies. When reel-meets-real life sorts. Its quite filmy and like Sabya’s catalogues like someone said above. The overall curated/staged effect takes away from the natural/spontaneous charm of a wedding. What a gorgeous couple. Love every single picture. Just for a simple thx giving I host, I plan ahead with food, cutlery, dinnerware, floral arrangement (s) and what kids and I will be wearing.. Wedding is a such a special event – so why not; people plan for years and look forward to it..
Their wedding photos take my breath away every single time I see them. Everything about them is perfect ! The clothes, the jewellery, the focus on tradition , their chemistry and most importantly the love they have for each other. PERFECTION ! Released that many pics cause they didn’t got that much hype compared to Virushka wedding? Or they were expecting it.. considering Anusha n Virat were discreet even about their dating days, so the marriage was a huge surprise.. and brought us some beautiful pictures in love. They were aware of the media frenzy so maybe like taking careful steps..
You kidding right?! Just check their social media likes and the press coverage. DP’s first post has around 6.5 million likes while Virat’s post on their wedding has around 4 million. Their wedding was also mentioned in international magazines like Harper’s Bazaar US. 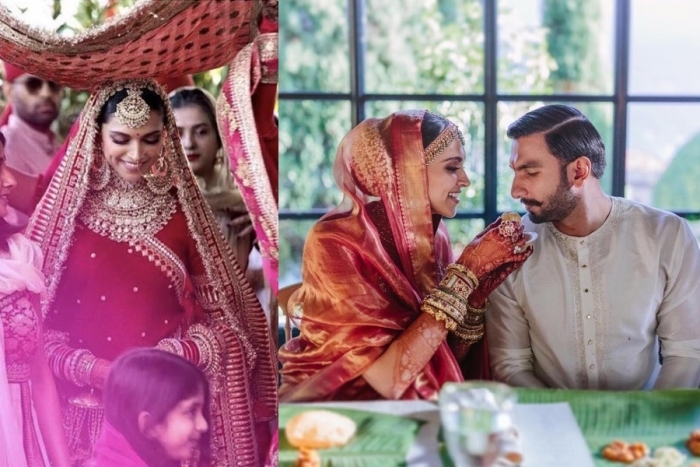 Weddings are not competitions and Deepika-Ranveer certainly don’t need to compete for press coverage. So y r u proving it? There’s no comparison of who got more likes, votes.. it’s just about how detailed the releasing of pics is, almost planned unlike other stars who were quite open about sharing it in the very moment. It’s a response to Fashion fanatic’s comment on their wedding not generating hype in comparison to Anushka-Virat which I am calling BS on. It could be a PR strategy on the timing of photos etc. but the fact remains that this is the union of two huge stars and they would have gotten press coverage regardless. Sabyasachi has released a statement on his insta page that the saree Deepika wore to her Konkani wedding is from a store in Bangalore ‘Angadi Galleria’. In the caption below he thanks Shefalee Vasudev for ‘aligning the information’. Really? You don’t and didn’t know what wasn’t made by you and need someone else to ‘align the information’..? Angadi Galleria eh? I need to check it out when Iam in Bengaluru next. Incidentally Angadi in Kannada means shop or store. 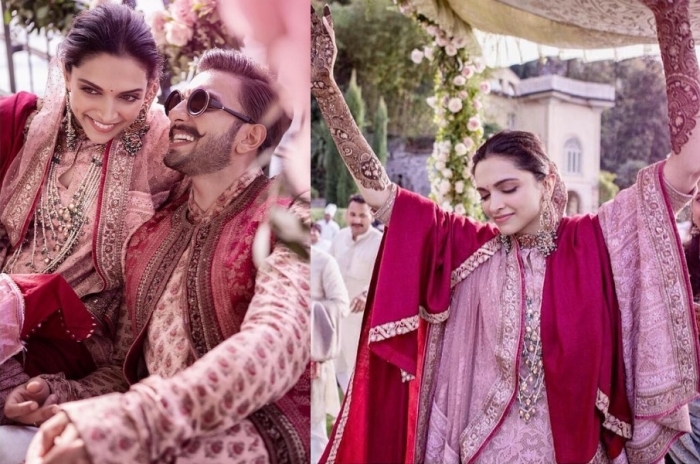 Deepika wore Saatlada necklace and earrings from Telangana with the pink outfit on mehendi day. Sonam wore Guttapusala haram and earrings from Telangana/Andhra on her wedding day. no her jewelry was from Sabyasachi. Nvm I just re-read the jewelry comment ignore previous comment please lololol. What’s the pink mehandi outfit? Saree or suit or lahenga? Looking at the comments section of HHC these days makes me sad. Back in the day we actually had true fashion enthusiasts making constructive comments, and now the comment section has turned into PR battlefield just like Pinkvilla. I can’t help thinking how dignified and natural some of their contemporaries who married recently have been compared to this PR exercise.